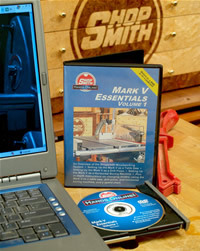 If you’ve been wondering whether or not the Shopsmith MARK V Multipurpose Woodworking System is for you…or have just purchased or inherited a new or used machine and would like to see it put through its paces…this great Nick Engler hosted DVD/DVD-ROM is most definitely for you. In this video, Nick will begin by introducing you to the concept behind this well-known American Legend and describe the main components of the machine and how they function together. How to set-up and use the MARK V Table Saw, including the different blades that are available; how to mount them; positioning the Worktable; making vital adjustments; using safety devices; and working with the Miter Gauge, Rip Fence and optional CrosscutSliding Table. How to set-up and use the MARK V Drill Press, including raising the machine into vertical position; adjusting the Worktable for drilling; installing the Drill Chuck and bits properly; using the Rip Fence and Miter Gauge for controlling the workpiece and performing repetitive operations; setting the Depth Stop; adjusting the speed and using the Telescoping Legs for added workpiece support. How to set-up and use the Horizontal Boring Machine, including adjusting the Worktable height; using the Rip Fence as a backstop; adjusting the Depth Stop and using the Miter Gauge to ensure perpendicularity.